My last post had nothing but planned shots. This image had almost zero planning. It happens more often than we amateur photographers care to admit: That perfect accident when all the right ingredients jump into the baking tray, throw themselves into the oven, and instruct it on how long to cook them, and at what temperature. A few weeks ago, I was taking shots of trucks and construction vehicles for my Mangaf blog. This photo stood out from the rest. It has that special feel to it - that differentiates an acceptable photo from an exceptional one. Analysing it today, I can see why I like it. The letters in the logo have a 'used' - almost abused - feel to them, which adds a rugged feel to the already-macho bulldozer. The second half of the word is missing, but it's such a well known brand that almost everyone will read the full thing in their mind. The focal point is the letter 'A' which is also the place that Caterpillar place their emphasis via the little yellow triangle. Finally, the way the photo is broken into the rule of thirds, both horizontally and vertically, creates an interesting result. I did compose and take the above image. I can't, however, take credit for knowing any of these factors at the time of shooting. nice one :) i love the way the picture is taken...the angle and the curves in the letters are beautiful! صورة رائعة من مصور مبدع ..! وهذا الأمر من مهنة التصوير يصادق عليه رب في كتابه ..! فقبل أن اعطيك الآية التي تخص كيفية التصوير عليك معرفة كيفية تفسير الكتاب ..! كلمة ذهب لها معنيين وهما : الطريق بمعنى ذهب .. والمعنى الآخر الذهب الخالص ..!
" المال والبنون زينة الحياة الدنيا والباقيات الصالحات خير عند ربك ثوابا وخير املا" ..والآن بعد سرد المقدمة لفهم الموضوع , سوف نسرد الآية التي خصها الباري في التصوير وكيف القرآن يواكب العصر لقوله : " ولقد خلقناكم ثم صورناكم ثم قلنا للملائكة اسجدوا لادم فسجدوا الا ابليس لم يكن من الساجدين" فماذا صونا الباري , فيشير الله في آية ثانية لقوله : "هو الذي يصوركم في الارحام كيف يشاء لا اله الا هو العزيز الحكيم" فهنا التصوير يشير إليه الباري هو السونار لإنها تفسرة الآية صوركم في الأرحام ..! فيا عزيزي بويوسف التصوير تستطيع البحث فيه في القرآن وسوف يوصلك الباري لمعاني أكثر وأكتشاف أكثر من الإبداع الذي عليه الآن وتكون ظاهرة عصرك ..! وصورك تعتطي التأمل فيها والتفكر ..! Love this shot BuYousef. have a great weekend. Seriously fantastic! 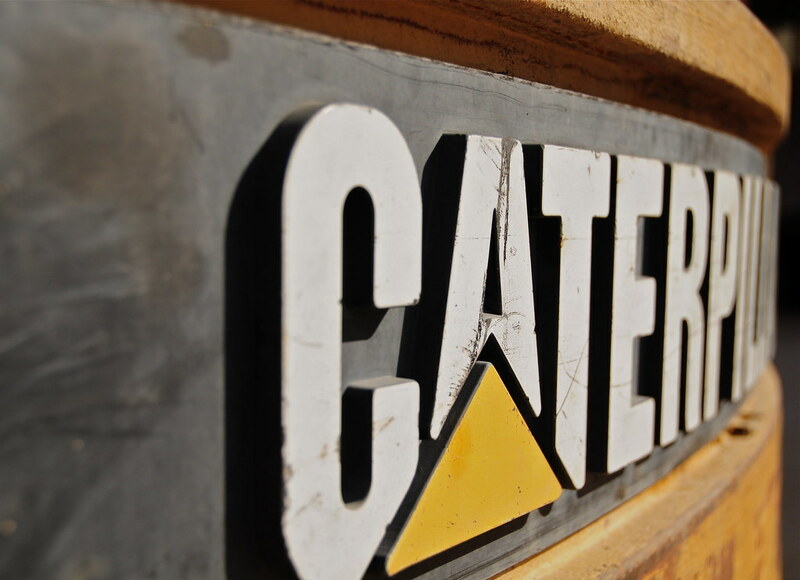 I love Caterpillar as a brand it always felt like that solid company! I remember back in the day when we had Caterpillar shoes and bags, when they were popular! Ur right about the photo, the used feel of the letters, almost abused! Perfect orientation of the object! It's quite a raw shot. I mean, the Caterpillar logo has digs and cuts in it; symbolic of the brand really, and of how heavy-duty it is.